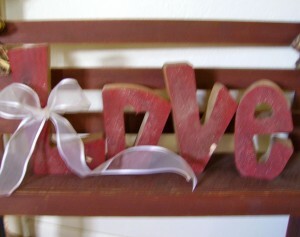 I loved these “L O V E” letters I bought up in IF a couple of months ago. I love the shear wire ribbon and bow. 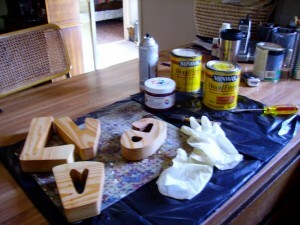 And last night I painted some more letters my favorite sage color. I think I’ll add a black [or black and red bow] and see if I can get it to Michelle Bradshaw who was married last November or December. I’m way behind on wedding gifts, but just this week I started a crafting streak and don’t expect to see the kitchen counter for a month or so. I was just asked to teach a craft class for our local community college. I don’t know. I can’t decide. I appreciate your willingness to teach. I am attaching some basic information for instructors and a blank course outline. What we do, is have people who are interested in teaching fill out the course outline and return it to me. We use the information in the catalog. Your pay is not posted but we can pay by the hour (generally $15) or by the student. We can have a supply fee for the students that they pay at the time of registration or we can give them a supply list of things they need to bring the night of the class. It is very flexible and we really can do whatever you like. We are working on the catalog right now so if you could get this back to me ASAP. I would appreciate it very much.